This analysis is also published on Al Jazeera. The 50-seat bonus in parliament that goes to the top party also helps New Democracy in practical terms. It could, in theory, form a strong Europeanist coalition with the other parties that continue to uphold Greece’s loan agreements, the socialist Pasok and the moderate Democratic Left. Together they could wield a formidable 179 seats in the 300-seat legislature, effectively a two thirds majority. This is a far cry from the May election, when Samaras and socialist leader Evangelos Venizelos were unable to make the 151 seat minimum and would have had to ask for a vote of tolerance for a minority government. As the centre-right flagship newspaper Kathimerini put it in a front page leader: "Pasok should support such a government, participate with its best talent and lend its weight in the national effort. Any other strategy would be nothing shy of criminal with respect to the country's interests. The same applies to the Democratic Left, notwithstanding the limited support it can offer to a coalition that will be called upon to take tough decisions." Syriza has done extremely well out of the last two elections. It sextupled its share of the popular vote and turned its 13 seats into 71. These are historic achievements for the left, whose combined share of the vote in the last four decades has never risen above 13 percent. Tsipras will likely now occupy the anti-austerity pulpit Samaras once did when the socialists were in power. He vows that, unlike Samaras, he will stick to the guns of opposition to what he calls an “unholy alliance of the forces of the past,” a reference to the socialist and conservative parties. His promise should be taken seriously. Syriza’s 17 percent in the May election was enough to freeze a privatisation programme Greece’s European creditors view as a major component of its bailout obligations. Privatisation promises to be a major battleground for another reason. Much of the support that has rallied behind Syriza consists of public sector unions that used to champion Pasok. Privatisation amounts to layoffs and lower pensions and benefits, which they are determined to fight. Their arguments are material. Syriza provides an economic theory to complement them – that Greece’s state enterprises are not monopolies, but require investment to compete in what are open markets. To sell them downriver is to display a singular lack of national pride. Whatever merit one ascribes to these arguments, the alliance between Syriza and the unions means that Syriza controls the street even if New Democracy manages to control parliament. The power of this should not be underestimated. It was weeks of protest marches on Syntagma Square that brought the government of George Papandreou to its knees last year, and after four years of recession Greece is heading into perhaps its most difficult winter yet. The fact that many households are now visibly struggling to feed and heat themselves highlights another area where Syriza can seriously erode the government – taxes. The socialists followed European instructions to raise consumer taxes, which punish the poor most. Heating oil and gas, which are heavily taxed, are now beyond the reach of so many, that many apartment buildings run minimal central heating and only thanks to the residents who can pay their monthly dues. This means that those who are struggling build up arrears of hundreds or even thousands of euro. They face similar problems keeping other utilities running, and many have only managed to do so by negotiating a payment schedule of arrears they know they cannot keep to. As if these problems are not enough, the government will face a major battle passing its 2013 budget in October. Unless Greece’s creditors offer a major extension of one or two years, Greece has to cut public spending by an estimated 11 billion euro next year and the year after. Most of those cuts come from healthcare, already struggling to cope with more than a billion in cuts this year, and the public payroll, which includes state enterprises. New Democracy’s strategy is to shift emphasis to growth. As its economic plan states, every point of GDP creates 45,000 jobs. That in turn bolsters state revenues, making everyone happy. But it would take a very competent government underpinned by a very efficient state longer than the next six months to begin to reverse a projected 5 percent drop in GDP this year, while staying on track to eliminate the deficit in 2014. Can New Democracy manage as well under the circumstances? Syriza has softened its position to accept the bailout loan in recognition of the fact that Greece simply has no alternative source of cheap finance other than the European Union. That is a significant retreat from its May 6 position, which was to look for alternative sources of financing in Russia and China, altering Greece’s orientation and loyalties. This is perhaps the biggest point in New Democracy’s favour. Just as Syriza holds the nuisance value of a Greek exit over the rest of Europe, New Democracy can wield the financial pipeline from Brussels as leverage over Syriza. First, though, New Democracy has to form a government. It must convince Pasok to abandon its insistence on a government of national consensus, which would include Syriza, and join its government of national salvation. Second, it must convince the Democratic Left, a Syriza breakaway, that it will not be politically diminished by joining a pro-bailout government without dragging the mother party along. If Samaras manages this over the next three days, he will have formed the broadest coalition that can be hoped for, and achieved a strategic first blow for political stability. This analysis was first published on Al Jazeera. 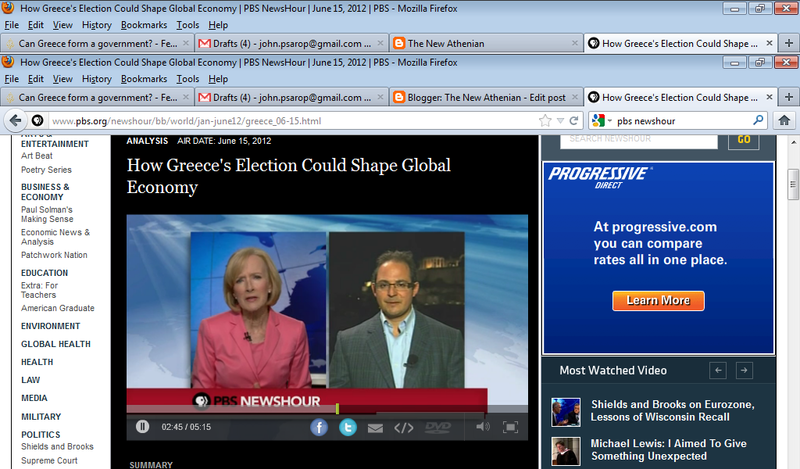 A related discussion on PBS NewsHour with Judy Woodruff is viewable online. The questions hovering over Greece’s June 17 general election are many and momentous. Can Greece stay within the eurozone, rebuild trust with its partners, fix its economy and reform its political system, all while governing itself democratically? Greece has had an appointed prime minister since last November and a caretaker cabinet since a May 6 election failed to produce a government. The country is now so distressed by four years of recession, a quarter of its workforce unemployed and many other unpaid or underemployed, salary and pension cuts of as much as 50 percent for those who still have them, a healthcare system showing signs of collapse and the all-pervasive question of whether austerity is bringing it closer to solvency or killing its economy faster, that people are apoplectic about whom to vote for. Parties have inevitably fallen into two categories: those in favour of the European-led bailout loan worth 130 billion euro but accompanied by a severe memorandum of austerity measures, and those against. Conservative New Democracy emerged as the champion of the former on May 6, with 19 percent of the vote, and radical left Syriza as the champion of the latter just two points behind. If opinion polls are any indication, June 17 will be a neck-and-neck race between them. Each was polling as much as 30 percent of the popular vote when a ban on poll publication in the last fortnight before the election took effect. This was still far shy of the roughly 38 percent of the vote needed to win power outright. Knowing that one-party governments are a luxury of the past, the primary goal for these two is to beat each other and claim a 50-seat bonus in parliament that goes to the top party. That could then put either of them within as little as a dozen seats of forming a government. Politicians have polarised the public in pursuit of that bonus. "We will on no account offer confidence or support to a pro-memorandum government," said Syriza leader Alexis Tsipras in a Contra channel interview on Monday night. "On June 18th we will have a government of the left, or a memorandum government. There are only two choices." New Democracy leader, Antonis Samaras, has portrayed the election equally starkly, as a choice between the drachma and the euro. He told voters in northern Greece yesterday: "This election... is about dilemmas that will be decisive for the future of our children - dilemmas such as whether we stay in the eurozone and stability, or go to the drachma and isolation." Far from the madding crowds, however, the line between pro- and anti- memorandum politics becomes more blurred. Yiorgos Stathakis, one of Syriza's four key economic policy planners, was more nuanced when he talked about Greece's loan agreement to Al Jazeera today. "We are not going to change it or renegotiate the loan agreement," he said. "But concerning the Greek programme – internal economic policies – there we propose a completely different plan to get the economy out of the recession and be able to have some form of social cohesion again... we will not move unilaterally to make some sort of break with our European partners." Notis Mitarakis, deputy shadow finance minister for New Democracy, also left the door open a crack for a possible collaboration with Syriza. "We need to change the [austerity] policy, because austerity alone hasn’t worked, and... we need to make all the changes within the European framework," he told Al Jazeera. "We will talk to anyone who feels comfortable with these two conditions. Greece is holding this repeat election because of the two parties' refusal to collaborate last month. They were punished for this. Nothing was more evident after the election than voters’ utter contempt for the entire political class because of their failure to achieve a patriotic consensus. It is now evident to the political world that Greeks are not going to the polls to create two sumo wrestlers. As Stathakis tells Al Jazeera, "If we are the second party, we will allow New Democracy to pursue its policies and we’ll support whatever is positive and be critical of whatever is negative. I think New Democracy will do the same thing if Syriza is the first party." There are fears that a coalition excluding one of the two big players will merely buy time until the 2013 budget is presented in October. But a spirit of bipartisanship could also be built. The two parties have similar social platforms. Both want to help over-indebted households that pay more than 30 percent of their income to banks. New Democracy, for instance, would give them the chance to service only interest payments, excluding principal, and would subsidise interest on first home loans to the tune of two percent. Syriza would extend loan maturities to bring down the monthly bill, and it would completely write off loans to those not meeting a "dignified means of living". A second area of attraction is an emphasis on growth. Both parties want to help kickstart the economy by bringing as much revenue as possible from public real estate and natural wealth, such as renewable energy. Both want to use every available penny of EU funds (Greece still has not absorbed some 14bn euro in Community Support funds). Both want to reshape farming to produce high-end, exportable goods, extend the tourist season and bring more Greek shipping under the Greek flag. Both are committed to cutting waste and corruption in the public sector. New Democracy wants to start governing with just 15 ministries, reducing them to ten. Syriza wants e-government, e-procurement and transparency everywhere, something begun by Pasok. Above all, both want to keep Greece within the eurozone. But the two parties’ substantive differences will be hard to bridge. New Democracy wanted to lower the top tax bracket to 32 percent, and have a flat 15 percent corporate tax. Syriza wants to slap the rich with a 75 percent tax rate and visit particularly harsh taxes upon large corporations. New Democracy wants illegal immigrants to be sent to detention camps and then deported. Syriza wants those detention centres to be open reception areas and to abolish deportations. It is difficult to see these differences being bridged without breaking moulds of party thought and suffering losses on the extremes of each party. Syriza and New Democracy might, of course, make a stronger effort this time around, seeing how much closer the country is to the brink of collapse in social services. But unless one of the smaller parties relents and agrees to form a coalition with one of them, they are equally likely to try for a third round of elections. By then, the public payroll, pensions and healthcare may have begun to unravel so badly that central debate of these elections would be moot. Greece could be in an ever clearer state of bankruptcy and its fiscal adjustment would have to take place overnight. An edited version of this story was published by Al Jazeera. Rice grower Yiorgos Tsigas unloads five-kilo sacks to sell at cost price. "If it weren’t for the movement we would have a problem… rice gets left in our store rooms because there is competition from imports; traders don’t pay as much as they should and often pay in four- or six-month cheques. We used to get 110c-120c per kilo. Now we get 100c. (Photo by Anna Psaroudaki). IT HAS GONE largely unnoticed that during its worst recession in living memory, Greece has also preserved a positive rate of inflation. When an economy shrinks, prices are meant to go down as demand falls. This has not happened - at least not yet. While the Greek economy shrank by an average of five percent a year in 2009-11, consumer prices rose by an average 3.7 percent a year. The combination of falling revenues and rising prices has led to an explosive political mix. It is not politicians but grassroots activism that has come to address this issue. Last April the Greek Statistical Service reported a 24.6 percent drop in annual potato prices – the largest ever one-year drop in any commodity. The reason for this historic bit of deflation was what has come to be known as the potato movement, and it is having an empowering effect on Greeks not only as consumers but also as citizens and voters. The movement’s various manifestations spring from one seminal event. The eye of the potato, so to speak, was a free distribution of more than ten tonnes of spuds in the centre of Greece’s northern metropolis, Thessaloniki, on February 5. It was organised by a group of farmers from the village of Nevrokopi, Greece’s potato-growing capital, situated on the border with Bulgaria. The farmers were protesting against imports of Egyptian potatoes while they had barns full of the Greek product, after a meeting between the agriculture minister and potato importers days earlier failed to yield any concessions. The first to invite the farmers of Nevrokopi to sell their potatoes at wholesale prices was the Pieria Prefecture Voluntary Action Group, based in the northern Greek town of Katerini, on the foothills of Mount Olympus. The Group had been formed in late 2007, after a series of wildfires devastated Greece’s forests. Its founder, Ilias Tsolakidis, says he wanted to provide the fire service with an early warning system. Tsolakidis and his friends mobilised some 200 Katerini families to monitor the mountain around the clock through the summer. “We reported 23 fires and the fire service nipped them all in the bud,” Tsolakidis says, but “when the summer of 2008 was over we felt we needed something to do.” . The Group was already busy creating a free supermarket for the destitute when it heard of the potato handout in Thessaloniki. On February 19, it organised a sale of potatoes to the Katerini public at 25 cents a kilo - one third of market price. Days later, the movement spread to Thessaloniki’s Aristotelian University. Christos Kamenidis, a professor of agricultural marketing, organised a sale of potatoes on campus using student volunteers. “I was worried that we would sell three or four tonnes. We sold fifty tonnes on the first day,” Kamenidis says. “People just fell upon the produce. The producers couldn’t cope with demand.” Kamenidis describes the queues these sales have generated as being “like a pilgrimage or a prostration”. The entire greater Thessaloniki area now holds regular sales of cheap produce, and the movement has spread south to the capital, Athens, and beyond. The potato movement is changing the food market. “Competition has increased,” says Kamenidis. “The stores that once sold for 75c are selling for 45c, and I heard prices as low as 19c.” And the effect has not been limited to potatoes. Other basic durable goods such as olive oil, flour, rice and honey have also gone on sale directly from producers, undercutting market prices by half. The potato movement is giving renewed impetus to two institutions that ought to have channelled market economics in hard times but didn’t. Farmers’ cooperatives were set up in the 1980s to give producers the clout to compete with wholesalers. 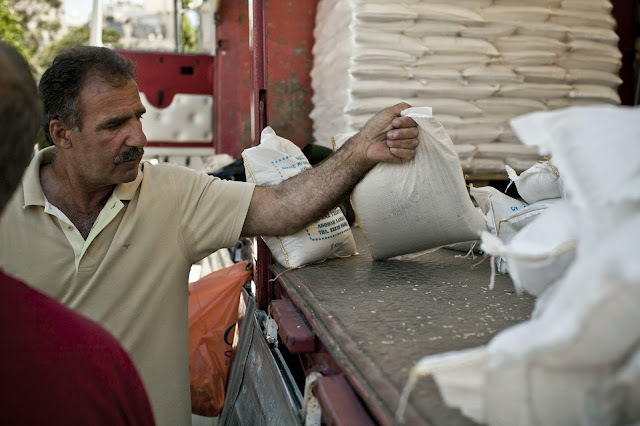 “Cooperatives have the ability to sweep wholesalers aside, but they don’t sell any cheaper,” says Kamenidis. “They mark up produce even more. It’s a tragic and unacceptable mistake.” Farmers’ markets, set up throughout Greece to help producers compete with retailers, fell prey to the same greed. “Producers have succumbed to the logic of the market. They are trying to gouge consumers in the same way as middlemen,”says Tsolakidis. The potato movement has not gone unchallenged. “Now there is a war breaking out,” Tsolakidis says. “The potato sorting and packaging centres are raising their prices to producers.” Controlled by wholesalers, the centres are using their leverage to inflate producers’ overheads. His Group is now asking potato growers to package in the field. There are other problems. Even in these desperate times, not all producers recognised the opportunity of the potato movement they helped start, says Foteini Arnaoutoglou, a potato farmer and local organiser in the village of Vrontou, near Nevrokopi. Arnaoutoglou and the growers she coordinates sold their potatoes at the cost price of 25c a kilo, and have the cash in hand to sow next year’s crop. The holdouts are stuck with potatoes they may have to sell over the border to Bulgarian middlemen for 10c a kilo, or with cheques and IOUs from Greek middlemen that haven’t been honoured in two years. Even when farmers do pull together and establish a viable cooperative, their existence is precarious explains Tasos Antoniou, a 31 year-old dairy farmer from the village of Leivadi on Mount Olympus. “There are cartels. All the dairy companies trade on the same price basis each year. It is very rare to see differences between them, and it only happens when a company is trying to squeeze small cheese producers out of the market.” He and a small band of young farmers have formed a cooperative that sells directly to shops or through the potato movement. But since they have only found markets for a third of their capacity, they are vulnerable to a price attack. Antoniou points out that without the crisis there would be no change in consumer attitudes to support Greek products. “I am optimistic that our cooperative will do quite well, and we shall fight through the difficult years.” His cooperative has gained a toehold among Belgian delicatessen stores, and Arnaoutoglou is building a site to sell directly to the public, or wholesale overseas. Even in places where the potato movement has nestled directly in the folds of political power, that power is tinged with anti-authoritarianism and an emphasis on individual empowerment. Tzanis and his team have plunged into a series of social measures. They have secured European Union funds to assist poor children and battered women, and have already organised six distributions of rice, flour, potatoes and oil on the town’s main square. Tzanis has also defied powers greater than himself to raise his voters’ quality of life. He recently bulldozed his way to a municipal waterfront leased to the Peiraieus Port Authority, a wealthy public company that runs the country’s largest container terminals in collaboration with China’s COSCO, and is organising children’s activities there. Tzanis is in talks with Formula One to recast his municipality’s coastal highway, already highly developed for truck traffic, as a racetrack abutted by parks. His goal is nothing less than a recreation economy built from scratch to tame a 50% unemployment rate. Tzanis, who has travelled from the bottom up to win election without party backing, would appear to represent the new type of politician. The new values may be limited to grassroots activism and local government today, but judging by the ferocity with which Greek party hierarchies are being shaken, it may only be a matter of time before they reach the top. Greece’s Potatoes have perhaps always been rooted in a sense of subversion as well as democracy. They were first cultivated during the Greek War of Independence in the early nineteenth century, and became a staple of the new nation. Greece’s first prime minister, Ioannis Kapodistrias, is said to have tried to popularise them by handing them out for planting. Suspicious of anything that was given to them, the apocryphal story goes, the Greeks shunned the new fruit. So Kapodistrias placed the potatoes under armed guard, ordering the sentries to turn a blind eye to looters. Within days the spuds had disappeared into nearby fields. Perhaps potatoes have again come to symbolise a commodity as widespread as the thirst for democracy, but one that has to be procured in spite of authority. A politician from Greece's far-right Golden Dawn party is now a fugitive after assaulting a colleague on a live television talk show. Prosecutors have issued an arrest warrant for Ilias Kasidiaris, the party's spokesman. The attack has shocked many Greeks who are just days away from elections which could determine their future in the eurozone. 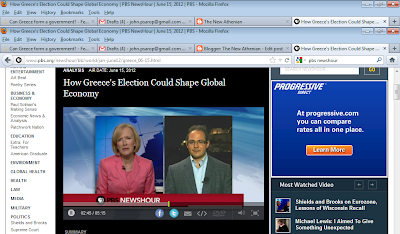 From Athens, John Psaropoulos reports. This post was first published on Al Jazeera. The Chop-Chop café on Athens’ western outskirts no longer lives up to its name. Time is the only luxury here, where men with little work, no money and a mountain of debt live out the sunset of their shipbuilding careers. Across the street, skeleton crews carry out maintenance on a few dozen luxury yachts and a handful of passenger ships, but the lucrative days of construction and major refits are gone. “I’m waiting for an aunt to kick off and leave me with a property or two,” says turner Spyros Germenis, 57, who supports a wife and teenaged daughter. He is only half joking. He hasn’t worked in a year and a half, and his savings are running out. Beside him sits ship’s carpenter Dimitris Kasdaklis, 60, and father of three. “We live off spaghetti and rice. Occasionally I find a chicken for a couple of euros. But we live off the charity of friends and a tab at the café. We’re talking about utter degradation.” Kasdaklis no longer has a phone line, and fears he will soon lose electricity too. The collapse of Greece’s ship repair and shipbuilding industry has left four in ten people jobless in the municipality of Perama, half an hour’s drive from the centre of Athens. In the industry itself, more than 90 percent are jobless. That has triggered a humanitarian crisis. While public hospitals will generally treat even the uninsured, there is no state machinery to provide the needy with food and medicine. The local church now runs a soup kitchen and the municipality has stepped in with a free supermarket, stocked with goods that are withdrawn from retail shelves as they approach their sell-by date. A free pharmacy and municipal soup kitchen are soon to be added. But it is not enough. Perama’s mayor, a co-founder of the Greek chapter of Doctors of the World, helped set up a local centre that regularly hands out food, medicine and clothing. Volunteer doctors hold surgery hours for free. But the real challenge is to bring back jobs. By tonnage, Greeks own a phenomenal 16 percent the world’s merchant fleet – the largest proportion controlled by a single nation. Since the turn of the century, shipping has brought about 150 billion euro into the Greek economy. Almost none of that was in ship building and repair. Shipyard owners in Perama blame the rigid labour regime imposed by unions. “If the unions were to shut down, the work would increase geometrically,” says Vasilis Halkitis, a third-generation shipyard owner. “There are Greek shipowners who want to come here and won’t because of the unions.” Halkitis was forced to let a third of his workforce go in the last two years, but held onto anyone he has employed for longer than 15 years. “They are family,” he says. As he spoke, dozens of carpenters picketed his yard, angry that one of his subcontractors is boycotting union labour. A new law, passed as part of a controversial reform package in February, allows employers to draft individual contracts with each employee and ignore union wage agreements. Riding a backlash against pay cuts that could translate into gains for the radical left in Greece’s upcoming election this month, the unions are fighting back. “The unions have made a stencil contract that they hold up to us and say, ‘if you don’t sign it you can’t work’,” says Halkitis’ subcontractor, Stavros Bourikos. Were he to give in, he would lose the right to choose his workers and his labour costs would rise. “The union doesn’t allow overtime and forces you to take on more workers instead,” he said. Those costs may not at first seem uncompetitive. The best paid workers take home 97 euro per day; but the daily cost from the employer’s point of view rockets to 260 euro because of social security, union fees, clothing and vacation allowances, plus the fact that union labour must be paid six daily wages for a 35 hour week. “People need to continue to receive their basic salary because they only get 150-200 work days a year and can barely make ends meet,” says shipyard owner, Yiorgos Frantzis, who has shed ninety percent of his workforce during the crisis. But, he says, “we need to bring the cost of labour down by 50 percent. It can be done.” Frantzis proposes cutting social security contributions by half and removing other perks; but unions insist that labour cost is not the bogeyman. Binos blames poor government planning. Perama’s shipyards are small. They have no floating docks and share a single dry dock. They have traditionally depended on subcontracted work from the two major shipyards that flank them – Elefsis and Hellenic. But these yards now send little or no work to Perama. The European Union has barred Hellenic from commercial ship repairs because it is favoured for defence contracts, and Elefsis has very little business. That has left the Perama yards catering to a limited market of recreational yachts and the occasional ferry maintenance. The real treasure – the 264 million deadweight tonne, Greek-owned merchant fleet - sails past them. Perama’s current mayor is less optimistic about the area’s chances of reviving the yards. He is already seeking investment in new industries. “Our municipality is forgotten and forsaken. Tourism would develop commerce, bring business to our shops, improve our roads, bring income,” says Pantelis Zoumboulis, who faces a 200,000 euro monthly budget shortfall and has trouble making the municipal payroll. He has earmarked a site currently taken up by oil storage tanks for a shopping mall, maternity clinic and an extension of Peiraieus University. But his pet project is a million square metre park on the top of Mount Aigaleo that would connect to a yachting marina. “We would have sporting facilities, a spa, even a casino and restaurant,” he says. The marina would be a natural fit with the shipyards. Perama is perhaps Greece’s most important historic shore. It is from here that the ancient Athenians sent their women and children across a narrow strait to safety on the island of Salamis, while they manned their ships to defeat a vastly superior Persian fleet in 480 BC. The Athenian victory at the Battle of Salamis was due to Themistokles’ correct reading of an oracle advising them to “trust in their wooden walls.” Those who took these to be the city walls perished in the sacking of Athens. Those who put their trust in the city’s brand new fleet returned to rebuild the razed city. Perama is similarly perched between old interpretations and new. Its unions insist on rebuilding the ship repair industry. Its mayor sees a future in offering recreation to a congested city. A new Battle of Salamis looms.